This is the second American edition of Sacred Clowns. This version is an inexpensive paperback printed by a division of HarperCollins Publishers, Harper Paperbacks. It was published in New York City, New York in 1994. 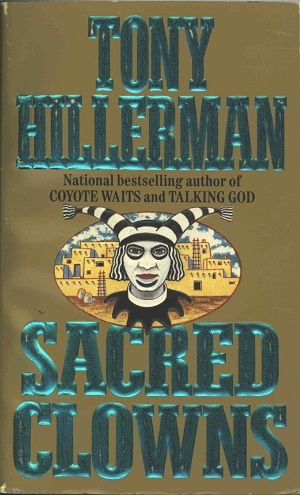 The cover illustration was completed by Peter Thorpe, whose covers have become the iconic symbols of Tony Hillerman's work. The cover illustration depicts a koshare or Pueblo Clown with an Pueblo village in the background. Format: Paperback, 17.1 x 10.6 cm. Binding: Full-color paper covers with the publisher's logo, national bestseller, title, and author are printed vertically on the spine. The inside front cover contains the publisher's logo, price and bar code. The inside back cover contains a photograph and brief biography of Tony Hillerman.